Many of our flag display cases and medal display cases are available with an optional Personalized Name Plate. Engraved nameplates feature an adhesive backing that allows for easy attachment to pedestals or glass fronts of flag cases and medal and award cases. Nothing immortalizes a special flag or collection of medals or awards like stamping one's name or group name on a flag display case or medal display case. Picture your personalized name, rank, branch of military service or public service position – or even a personalized message – with dates as an engraved black-on-brass nameplate on your important display case. Each nameplate measures 5 in. (W) x 1 1/2 in. (H), and comes with a maximum of four lines, approximately 34 characters per line. As with our flag and medal display cases, this Personalized Name Plate from flagsconnections.com is a great investment. 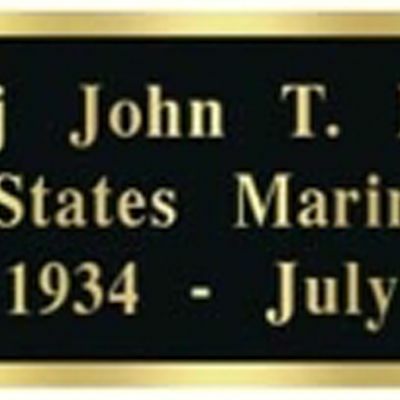 Not only are our military flag and memorial flag display case units crafted from only the finest, hand-selected hardwoods, our nameplates are constructed from only the finest brass and engraved with exceptional clarity and accuracy. Buying from flagsconnection.com means you are buying top-quality products, crafted so well and made from such fine materials, it is sure to be appreciated from generation to generation as a family heirloom.